As her voice has a pure quality, from the first, Sally's career gravitated towards Baroque music and she has been associated with most leading baroque groups. She has sung with London Baroque, The Parley of Instruments, Opera Restor'd, The Monteverdi Choir, Chiaroscuro, Les Musiciens du Louvre, Tafelmusik, Les Saqueboutiers de Toulouse and many other groups. She was a founder member of the original Accademia Arcadiana with Nicholas McGegan with whom she performed many times. Her recording of Handel's Agrippina for Harmonia Mundi records with McGegan was chosen as Sunday Times Record of the Year and Opera Now! Record of the Month. She recorded the role for the Gottingen Festival production. 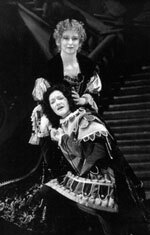 With the same conductor she has performed Dorinda in Handel's Orlando in St Louis, USA, Oriane in Lully's Amadis for BBC Radio 3 and three French Opera Comique roles by Philidor: Mrs Honour in Tom Jones; Victoire in Le Jardinier et son Seigneur; and Claudine in Le Marechal Ferrant. Sally has starred in baroque operas in Germany, notably in Handel's Alcina at the Hallé and Berlin Potsdam festivals, and has made more than 20 appearances in Austria in opera, concerts and recordings, including a live broadcast of Hasse's Piramo e Tisbe from the Musikverein, Vienna, the live recording of the world premiere of Cesti's Il Pomodoro at the Hofburg, Vienna, and the premiere of Scarlatti's Gli Equivoci nel Sembiante for the Innsbruck Festival. She has sung in concerts and recordings for the International Haydn Festival at Eisenstadt. With Marc Minkowski she sang Maddalena in Handel's Resurrezione at the Concertgebouw Amsterdam, and roles in L'Europe Galante by Campra at the Aix-en-Provence and Beaune Festivals.